The countdown started after nominees for the 2019 Black Engineer of the Year Awards were announced before Thanksgiving. It’s run through conversations in the BEYA community, on social media and Career Communications Group (CCG) print magazines. In addition to the Black Engineer of the Year Award (BEYA), category awards include the Dave Barclay Affirmative Action award. The Dave Barclay award recognizes efforts to promote affirmative action within an organization in education, job promotion, small-business development, and community activities. Akeem Iman-Jones, a 2019 winner of the award, is a human resources director, Boeing South Carolina, The Boeing Company. Iman-Jones is praised by his colleagues for his passion for inclusion as well as his dedication. As director of human resources for Boeing South Carolina, Iman-Jones leads HR initiatives and support to Boeing Commercial Airplanes 7,000 people across multiple organizations. He joined the Boeing Company in 2014 as the HR director for Boeing Defense, Space & Security in Washington, D.C.
Before moving to his current position, Iman-Jones’s impact on the discussion of diversity and inclusion were recognized by the 2016 Potomac Region Diversity & Inclusion Award from Boeing. He currently mentors 52 mentees worldwide. Despite the challenges Iman-Jones faced at the beginning of his career, his persistence and passion for his work have led him to become an influential figure in the STEM community. 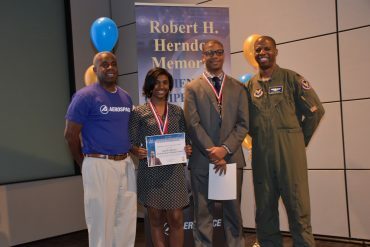 Learn more about Boeing and the Black Engineer of the Year Awards here. Hosted by US Black Engineer & Information Technology magazine, the Council of Engineering Deans of America’s Historically Black Colleges and Universities, and Lockheed Martin Corporation; the 33rd annual Black Engineer of the Year Awards (BEYA) STEM Conference will take place from Thursday, February 7 to Saturday, February 9 at the Marriott Wardman Park Hotel in Washington, D.C. This year’s conference theme: “At the Intersection of America’s Future” advances the decades-old mission of the BEYA Conference to shed light on the key issues in persistence of underrepresentation in science, technology, engineering, and math (STEM) and honor the men and women who are keeping the United States competitive in innovation, space/manufacturing/infrastructure technology, and the digital workforce of the future.